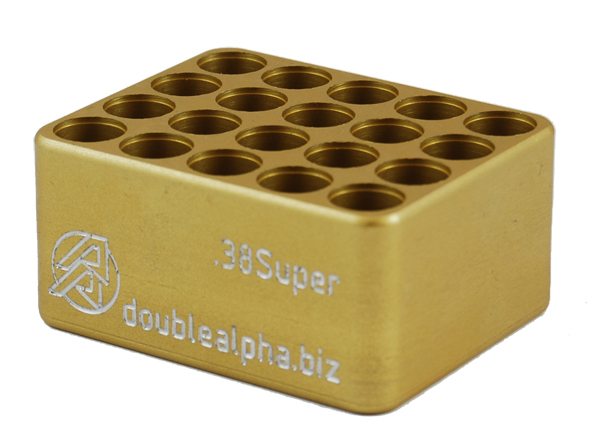 For all of you that are handloading, especially .45 ACP for my 1911, it's a must. 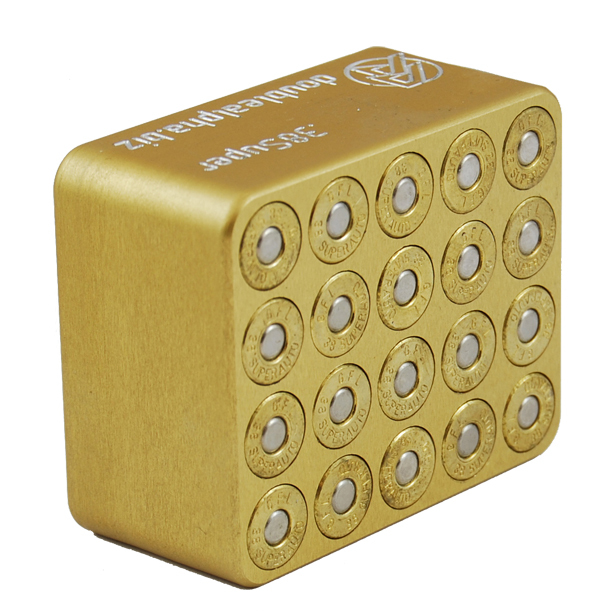 Perfect, not spending too much time but you are sure to be on the range with perfect ammunition. Must buy. With this item I am sure when the bullet-cartridge passes it will also fit my gun. I recommend it for every shooter, no hick-up's any more during stages. Simple, Fast, Fits in your hand. Awesome! 20 rounds at a time is much nicer than a single one. I love this little thing. Fast and easy way to check your ammo. If it fits in the gauge it fits in your gun. Period. Es más pequeño que el de Dillon, muchas balas que en este no acaban de entrar si lo hacen en el de Dillon. It is tigher than a Dillon case gauge. I'm not sure what to think of that with regard to the Dillon or DAA Gauge. It's indeed a good thing to have, easy and quick to use. It's a very solid piece of work. DAA 20 Pocket Gauge is brilliant. Prior to getting this I was barrell dropping prior to a match & this is so much faster & gives a good view to check primer seating. Gauging the ammo is no longer a chore I'm even doing it for practise ammo. I just love these 20-pocket gauges. I've got them in 9mm and .40SW and they save so much time. Thanks DAA-team. Any competitor serious about his shooting is aware of the importance of drop-testing one\'s bullets before a match. Since most malfunctions are ammo related, and most of those relate to deformed, bulging or otherwise defective brass - dropping the bullets into a gauge is an effective way to reduce the chance of a costly malfunction. The problem has always been that it takes time! over 15 minutes at least, to test 400 rounds with a single bullet gauge or using one\'s barrel. Well not any more! 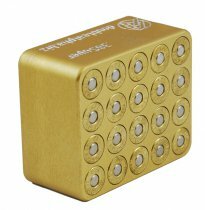 We are please to offer you the DAA Golden 20-Pocket Gauges, available in 9mm, .38Super, .40SW or .45ACP. These gauges are machined from top quality aluminium, and the pockets are finished using Clymer finishing reamers, the same which are used by top gunsmiths worldwide to cut the final dimensions on the barrel. The 20 pockets allow you to drop the rounds in a lot faster than into a single gauge, cutting your testing time down to less than half of the time! 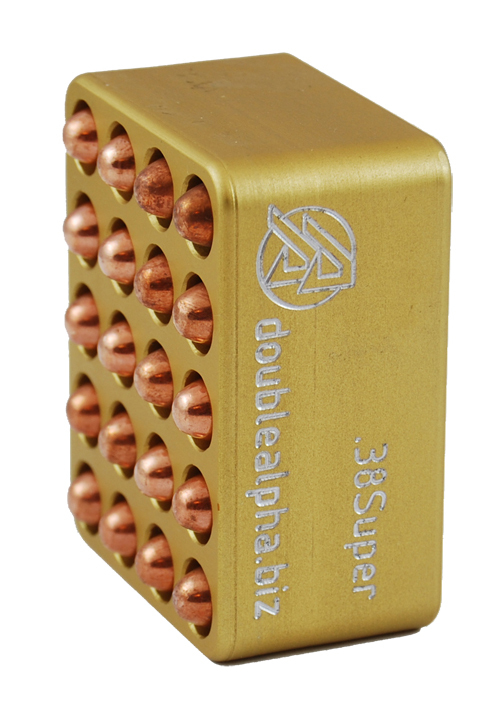 A great deal of thought went into the dimensions of the block: The bullet pockets were positioned as close together as possible, to allow dropping 2 or 3 bullets in at a time, in the same way you would fill your ammo boxes. The height is purposely cut shorter than other gauges, so that the tip of the bullet head sticks out. If a bullet gets stuck, as reloaded ammo often does - you can simply push it loose from below with your finger, without having to pick up a tool. The 20-pocket gauge works just great! It fits easy in your hand, is quick to fill and you get a good overview and comparison of primer seating. It decreases time consumption to somewhere between half and two thirds. If you dont own a case gauge, get one. If you like a solid, effective and really nice one get this one. There is no gain in the use of a single bullet gauge.